When a movie claims to be "based on true events", it's almost a joke now. It usually means there's a loose link to actual events at best. In historical fiction, it's common to have a basis in research and then play a little game of "What if?" Research into ancient Chinese texts presents an interesting quandary. Historical accounts are so imbued with romanticism and legendary exaggerations that history and fable become blurred. The research for the "East meets West" elements of BUTTERFLY SWORDS took an interesting twist and surprisingly, had quite a bit of documentation behind them. The first thread of inspiration came from comparative history. As history buffs, we tend to focus on one period or one area. But out of curiosity, I tried to match up one of my favorite eras, the late Tang dynasty, with western history and found an interesting correlation: the Golden Age of China coincides with the Dark Ages of Europe. The Dark Ages were a time of flux. 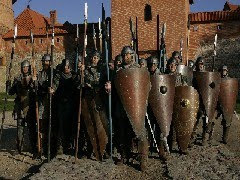 Rome had fallen and an array of different barbarian tribes wandered into the lands once controlled by the Roman Empire. At the same time, China was at one of its heights of culture and learning. This was the heyday of Silk Road trade. It also happened to be a time when women enjoyed more freedom and several prominent females such as Empress Wu rose to the highest ranks of power. The second thread of inspiration came from one of the barbarian tribes that challenged the Roman empire: The Huns. The Huns originated from the steppes of Eastern Asia but by the time they migrated to Europe, they had gathered a whole mix of cultures and ethnicities. Attila the Hun became embroiled in court politics when the Emperor's sister, Honoria, appealed to Attila to try to escape marriage to a Roman senator. Hmm...what if the barbarians went from the West to the East instead and their leader somehow got mixed up with an imperial princess of the Tang Dynasty? Now that things were starting to stew, I had to figure out how much contact there actually was between the East and the West before Marco Polo. It turns out that there are records of early contact in the Han Dynasty(AD 25-220). The explorer, Gan Ying, was sent on an expedition to Rome. It's believed that he made it to the shore of the Mediterranean Ocean before turning back. His travels are documented in the Hou Hanshou, a historical account of the later Han Dynasty. Direct contact between the two cultures was rare, but there are accounts of Roman ambassadors visiting the Chinese imperial court, sent by various Roman Emperors from the first through the third century. To Rome, China was known as Seres. Chinese silk was brought to Rome through the Silk Road and Roman good were traded in China. A 4th century Chinese document, the Weilue, contains a section called the People of the West where the kingdoms of the Middle East, India and Rome are described. Rome was called "Da Qin" or "Ta Chin" which means Great China. This document indicates that at the very least, China was aware of Rome and curious about gathering information about the great empire that existed on the other side of the world. So did western Europeans ever venture into China in the 8th century? Probably not. But was it possible? Maybe. More importantly, if they did, is that a story people would want to discover? I'm hoping so. All in all, it is hard, hard work "making up" any historical world, regardless of whether you are using actual historical figures or simply inspired by true events.